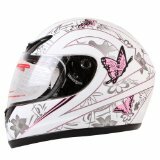 You’re here because you want to know more about the choices you have when it comes to choosing the best motorcycle helmet, football helmet, snowmobile helmet. Well, good thing you found us, because that’s exactly what we’re all about. One of the toughest things you have to deal with is all the information out there. We know that, and that’s why we’ve done all the heavy lifting so you don’t have to. From reviews to manufacturer specs to videos to research, we’ve compiled all the relevant data you need to make your decision – and we’ve even put it in an easy to digest format. 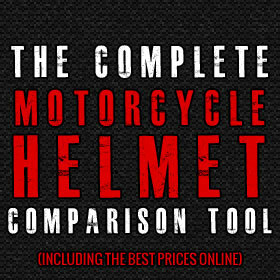 Start off with our handy comparison chart below, and then scroll down a bit further to find out our choices for the top 5 helmets. Or, find the category you want from the sidebar to the right, and find helpful articles and reviews tailored to your specific needs. You don’t have a lot of time to waste reading boring articles and digging through dozens of websites to find out whether a helmet is good or not – that’s why we created Helmet Advisor. Now get a move on and find exactly what you’re looking for! 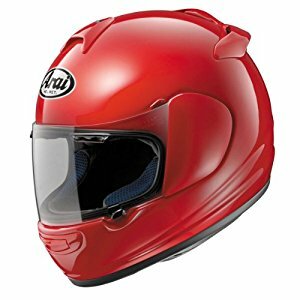 OK, so it’s hard to come up with a list of the best motorcycle helmets overall, because there are multiple different kinds, and what you are looking for will change what option is the best. However, if you want to know what most people are buying, what gets the highest reviews, and what we think makes the grade, start off by looking at the 5 helmets below. We’ve tried to include different styles and price points. If this isn’t what you’re looking for, go to our complete listing of the top 50+ lids by clicking here. The HJC CL-17 hits it out of the park in just about every category you can think of. 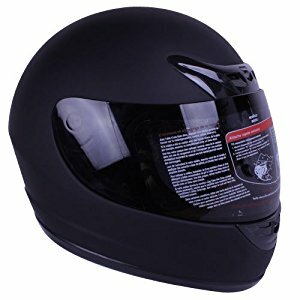 With both a DOT and Snell certification, the advanced polycarbonate composite shell helmet meets incredibly strict safety standards, which should be your top concern when choosing a helmet. The face shield is prepped to accept a Pinlock shield so you can easily add massive fog-resistance and UV protection. It’s incredibly easy to take apart and put back together, and all the parts that you’ll need to clean occasionally are simple to remove. The great thing about those parts is that they’re moisture wicking and the anti-bacterial fabric stops smell from becoming an issue. The CL-17 replaced the super popular CL-16 and has just taken it to a slightly more refined and even lighter level. It has an expertly designed ventilation system (and it’s even got a fancy name – “ACS” or Advanced Channeling Ventilation System). 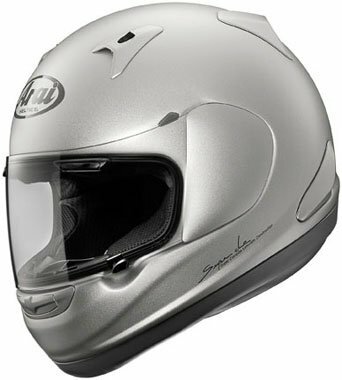 With airflow from the front right to the back, heat and humidity will not be an issue when you’re riding. One of the best things you’ll notice about this model is that you get a ton of value for the price (about $125), and riders are loving the thing. Wherever you look, people love the fit, style, and price of this HJC (and as a bonus benefit, you even get a pretty good selection of colors or graphics to choose from). 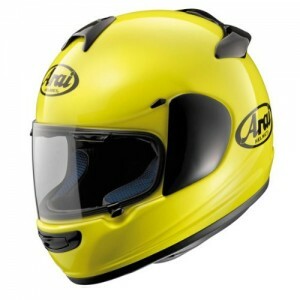 Arai’s most ‘basic’ or entry-level helmet, the Vector-2 is still miles ahead of most other companies’ high-end products. 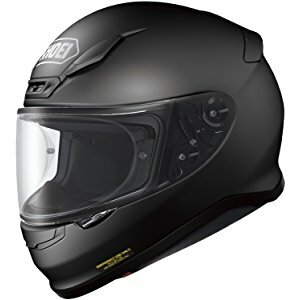 The only reason we’ll say it’s ‘basic’ is because Arai’s other offerings are so specialized and packed full of features. 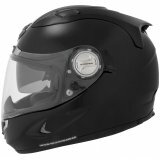 While you don’t get the same features in the Vector-2 as you do in the Corsair V, for example, you get an amazing helmet that not only keeps you safe by meeting the top DOT and Snell safety standards, but you get some excellent ventilation, a great shield, and what must be a load of money spent in Arai’s Research & Development labs making small but important improvements. The 2 has more peripheral vision thanks to a design upgrade over the original Vector, giving you 5 mm on each side, which adds up to a huge difference when wearing it. 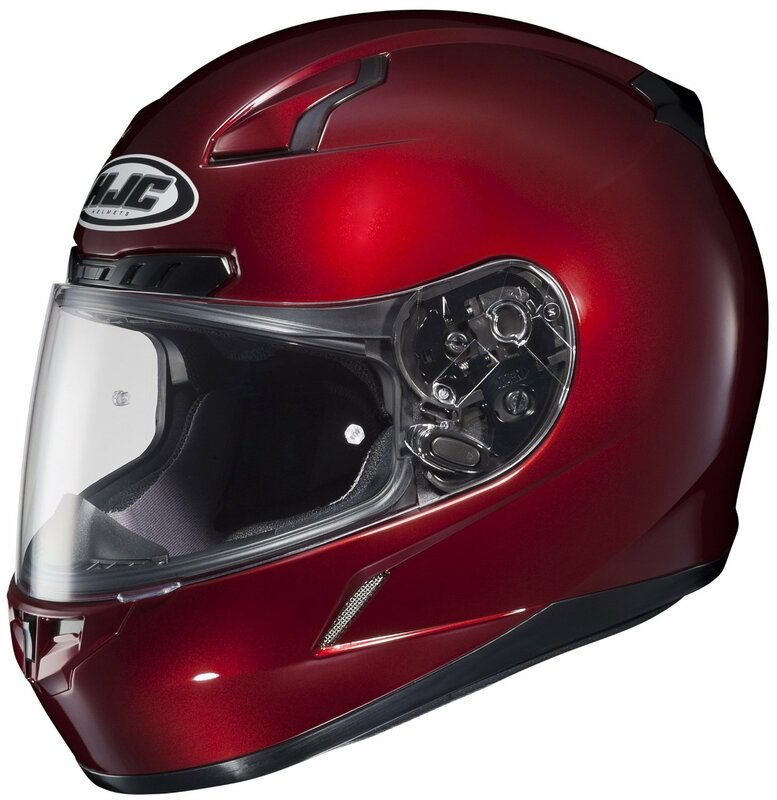 You’ll also notice clever liner and cheek pad improvements (adjustable cheek pads, actually), as well as pretty amazing ventilation work, with various front and rear vents working together to keep you the right temperature – the helmet even takes the warm air of your breath into account and makes sure it has an easy way to escape. 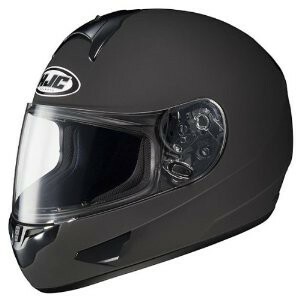 It’s definitely worth taking the step up and making the investment in a high-end brand like Arai and the Vector-2 is the perfect way to get used to the idea of owning a premium helmet. 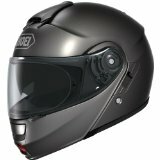 The DOT approved IV2 901 is probably the best ‘bargain’ helmet you can find. 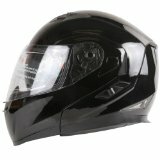 While certainly not loaded with features, you get a sturdy helmet for a really low price. Last we looked, you could pick one of these guys up from Amazon for under $50. That’s much less expensive than the premium brands out there, so if price is a big part of your decision, have a look at this. You’ll get a clear and a smoked visor, and it’s easy to change them, you don’t even need any hardware to do it. There are a 3 vents in the front, one at the chin, two just above the shield. Not much more to say about this, because this is really the price point talking here. Not the best on a purely quality and feature scale, but considering you can get it so cheap, and the fact that it actually has a pretty good 4 out of 5 star rating on Amazon (nearly 50% of buyers gave it a perfect rating), we had to throw this up here because it will probably cover the needs of quite a few of you looking to buy the right helmet. >>Click here to see pricing, ratings, and reviews on Amazon.com. 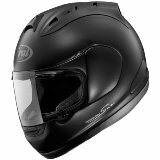 The latest addition to the long line of successful RF helmets from Shoei, the RF-1200is a seriously impressive premium unit. 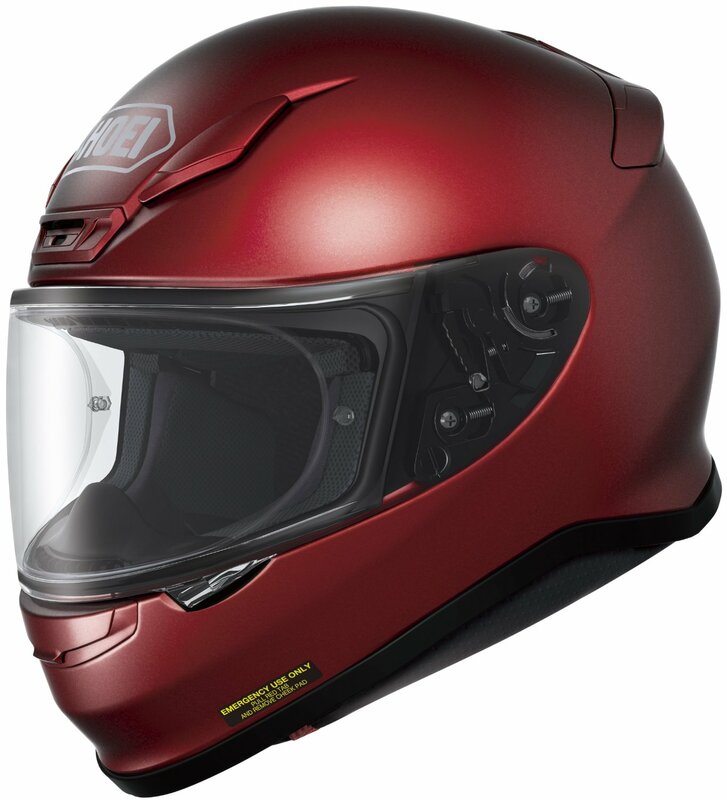 While taking the best of the 1000 and 1100 before it, Shoei has made this sort of a redesign. DOT and Snell approved, they’ve actually managed to cut down on the weight to make this a 3.5 pound unit. It’s quite a bit more compact than the models that came before it, and it’s almost as if the company has cut out the unnecessary and just improved and tweaked things to get it just right, which makes it a bit smaller and more compact. A lot of care has gone into making this comfortable and well-fitting, including things like an improvement on the moisture-wicking fiber of the inner shell. The ventilation has been updated, giving you more control and a better system, as well as a brand new shield and eye port. The great thing about this particular upgrade is that you can actually adjust the shield to lock in tighter or looser, depending on how you ride and depending on the weather conditions. The eye port also has a reinforced double walled gasket to make an outstanding seal against wind, noise, and the elements. If you’re just getting into the premium market and come across this helmet, consider yourself lucky. The RF-1100 was so popular, like the 1000 before that, but this guy makes the line even more impressive. It will be a real treat to get your head in this and know that you’re totally covered no matter what comes your way. The only modular (flip up) helmet on our top 5, but many owners will tell you it’s the only one you need to look at. With nearly perfect reviews across multiple sites from real users talking about how good this helmet is, we’re totally comfortable recommending it as the best modular helmet you can buy. It’s basically a personal preference as to whether you get this type of unit, but if you dig the functionality and versatility of a flip up, you’ll be thrilled with the Neotec. Flip up the visor. Or the whole face. Flip down the built-in shade visor – or keep it up. The options are plenty, and they’ll suit whatever riding you’re doing, no matter what. All of the handling of the visors and shields and face part of the helmet are really easy, and can be done with gloves, no problem. The ventilation is good, the double EPS liner helps with that and with absorption, should you be in an impact situation, the liner is made to fully fit around your head plus it’s easy to take out and wash.
Basically, it’s got everything you need and expect from a premium helmet, and it’s made by Shoei, which means you’ve an absolutely fantastic company behind your helmet, which can really count for a lot when you don’t have to worry about the quality. 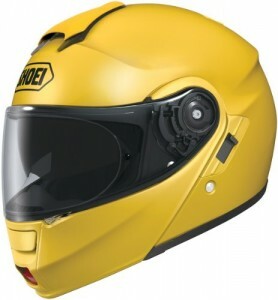 If you prefer a modular helmet, definitely give the Neotec a really good look.